It has been a long winter followed by a drought-ending deluge. Now we’re supposed to hit the mid-80’s by Wednesday? All things green are starting to pop, and though I’m worried about a fast forward spring and heading directly to summer, for now it is spring and that means the arrival of ramps. Also known as wild garlic, wild leek, and wild onion, the Latin name is Allium Triccocum. This pungent plant is edible, whites and leaves alike. While it is too early to forage for morels, last year I had spotted a small patch of ramps near my mushroom hunting spot and if there is a small patch, perhaps there is more. So this morning I went over to the area where I’d seen them and I was excited to discover multiple spots I harvested a small amount. I’m careful not to take too many from any one spot, I want them to continue to flourish. As I walked, it struck me, there are no ferns in these woods yet the ones in the garden are at fiddlehead stage and….. wait a minute! I’ll combine them to make a spring dish. I can’t take too many of the fiddleheads but I can use them for color and accent. I’ve adapted an adaptation (?) 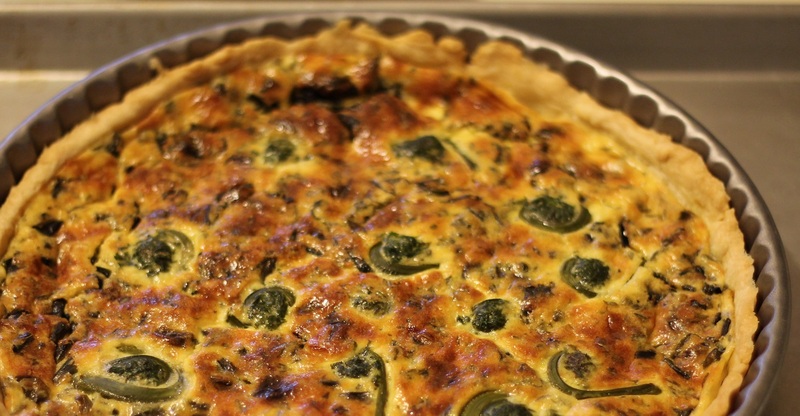 of Fragrant Onion Tart from “Vegetable Literacy” by Deborah Madison. I don’t own her cook book but it is on my wish-list. 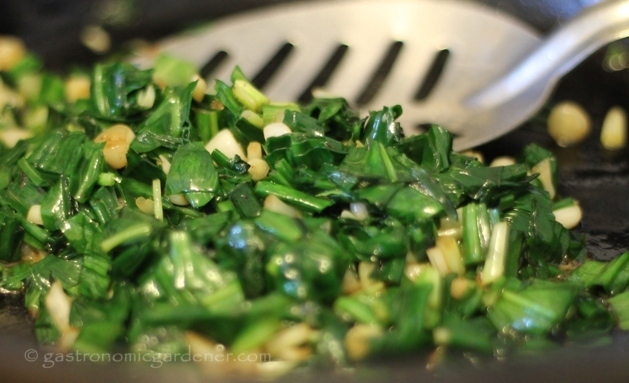 The long slow cooking of the ramps takes out most of the pungency, before they were cooked their, uh, perfume was filling the house, and that is only from a small bunch. Once cooled this onion and cheese tart is perfect for a brunch or light dinner. The finished dish is so good, I promptly ate two slices, the ramps were mild and the fiddleheads subtle. I’m looking forward to having some for breakfast! As a side note, yesterday as promised I sent out the notebooks to those of the first 100 subscribers who took the time to send me a postal address. It was great to hear the encouraging words from subscribers as they relayed their postal addresses. The nearest one lives only about 15 miles from here and the furthest one I sent was to South Africa! I’m curious to how long it will take to arrive. If you think of it, and you’re expecting a notebook, please let me know that it arrived safely and in good order. To the uninitiated “Ramps and fiddle-heads” must sound particularly unattractive! As you say, it’s a shame there were no wild mushrooms available, because I reckon they would have gone well in your recipe. Yep! Mushrooms would of been good! beautiful! i love the fluted pan – yay! It turned out pretty didn’t it OFG? 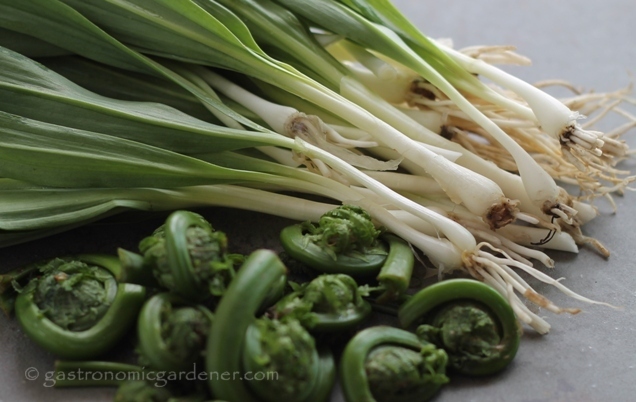 I’ve not tried fiddlehead, Dave, but I can’t wait to get my hands on some ramps. The farmers market opens on Saturday and I’ll be there bright and early to get some. Who knows? If I see some fiddleheads, there could be a tart on my dinner table this weekend. Thanks for sharing! If you can’t find the fiddleheads, go for the asparagus. This is so amazing! I feet my taste buds getting aroused!